This is the first year of Two Fat Vegetarians and it’s been a fun time for Sharon and I writing it. So we’re averaging about 10 visits a day. Our busiest day was 5th April, when we had 105 visits in total. In total we’ve had visitors from 63 different countries. You are all very welcome! My favourite section of the site stats WordPress provides is the search terms people used to find us. As you can see Slimming World Quiche and Slow Cooker Baked Beans are what the world wants to know about! i want to make a beetroot chutney, the recipe calls for raw beetroot but i only have cooked could i substitute it ? But however you found us, I hope you enjoyed your visit(s) here. Here’s to a bigger and better 2013 for all of us! As it’s coming up to Xmas. How about some recipes for dips to have with nibbles? Guacamole was never on my list of favourite dips until I had some in Las Vegas. It was made in front of us at the bar and the fresh creamy taste was far better than the sloppy, greasy stuff I bought in tubs at the supermarket. This is a great dip to have in your repetoir. It’s simple to make but tastes very impressive and after trying the home made, you’ll never go back to the shop bought kind. 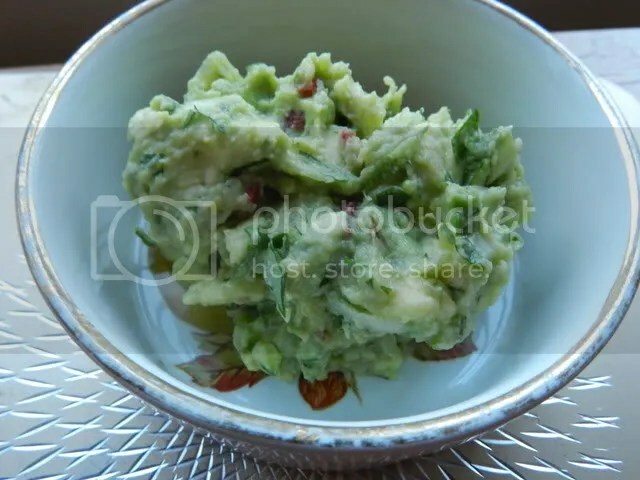 Put the avocados in a bowl and mash lightly with a fork. Stir in the rest of the ingredients and season generously with salt. Long story short, three of us needed to find somewhere decent to eat that was equidistant from Portsmouth, Salisbury and Bath. A friend from Bristol, who used to do the haul down to the south coast ferries regularly, suggested this pub called the Pelican Inn. She hadn’t eaten there that recently, but a browse of the website suggested there’d be vegetarian choices. And it turned out to be a very good choice. The pub is an old coaching inn in Stapleford, one of the Wylye Valley villages along the A36. It looks like it’d be a pretty spot in summer with a river out the back. In the winter, though, it was pleasant but unremarkable inside. I’m ambivalent about aubergine as, when cooked badly, it’s just a sponge for oil. 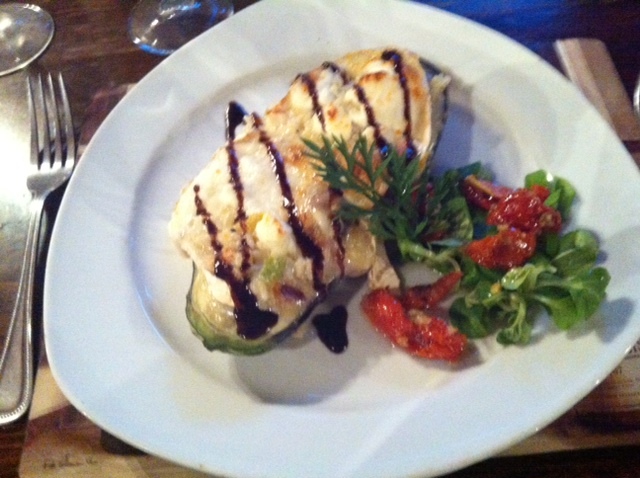 But the dish was rich without being heavy and the filling tasty (the garlic certainly wasn’t overpowering), with the sharp goats’ cheese and a drizzle of balsamic vinegar to set it off. It was beautifully presented as well, with a garnish of salad leaves and what I think were semi-sundried tomatoes. There was the fairly standard choice of different potatoes and either salad or vegetables to go with it. I went for the latter – and got a generous selection of buttery boiled potatoes, carrots, beetroot, swede and broad beans. The meat eaters seemed happy with their choices as well. The puddings were good and well-presented, too. I might have had profiteroles. *Looks shifty*. Service was friendly and efficient. I liked the fact a different waiter came back to say that the mousse one of my friends had chosen did have coffee in it – the original waiter hadn’t thought that it did. The Pelican Inn is definitely a good find and well worth a visit if you’re doing the Wiltshire/Hampshire trek, or if you can’t face trying to park in Salisbury – Stapleford is only about 15 minutes drive out of the city. 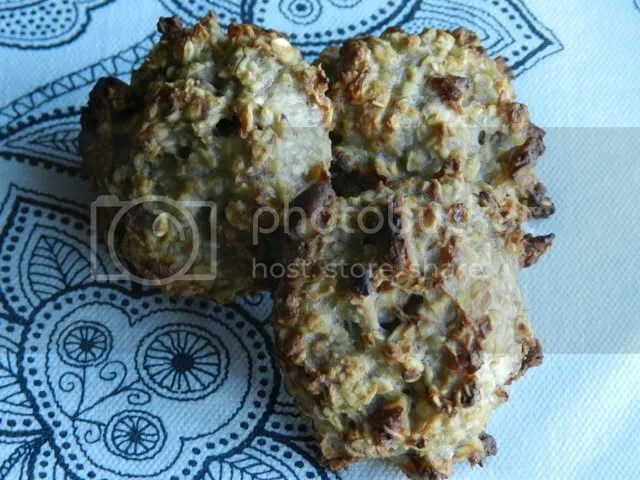 I stumbled upon a recipe for Two Ingredient Vegan Cookies a while back. It looked interesting but it also had vibes of the worse kind of hair-shirt-healthy-eating-beansprouts-and-hemp-sandals vibe about it. But this weekend I found some very ripe bananas in the fruit bowl and decided to give them a go. I’m so glad I did. These taste way, way, WAY better than the ingredients list suggests. They’re crunchy on the outside and soft and sweetly gooey on the inside. There is not the slightest hint of abstemious eat-it-because-it’s-good-for-you about them. These are proper cookies, they just don’t have egg, sugar or flour in them. Make some and hand them out to your friends. Don’t tell them they’re vegan. Don’t tell them there’s no added sugar. Just smile at them when they ask for another one! Put the oats in a bowl, add the chopped pecans and the peeled bananas. Mush everything together with a fork until there are no large lumps of banana visible in the mix. Spoon on to a baking sheet. Bake in a preheated oven (180C) for about 20 minutes. There are some cooks who pride themselves on being instinctive cooks, they never measure anything, they never time anything and they never give precise recipes. ‘Oh just boil it until they’re cooked,’ they say. That’s fine if you know what cooked broccoli (for example) is supposed to be like. What if you don’t? Should it be crispy in the middle or mushy? That’s why I tend towards the specific rather than the vague in my recipes. If you’ve never done it before, precision helps. If you have done it before you don’t need me to tell you when to go off piste in pursuit of your own tastes preferences. However, in my next recipe, I’m going to break that rule. In Laurie Colwin’s book, Home Cooking: A Writer in the Kitchen, she gives a recipe for potato salad. She doesn’t give any quantities. I’m going to take her ingredients and do the same, because who doesn’t know what potato salad is supposed look like? 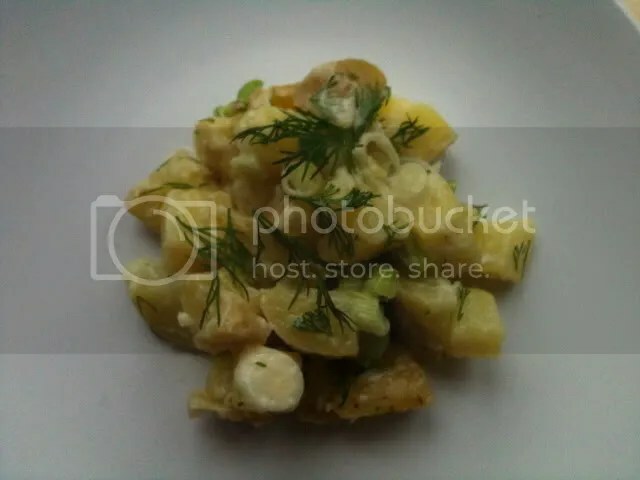 Boil some salad potatoes. When they’re cooked, drain them and leave them to cool for a while. You want the potatoes to be warm enough to absorb the dressing flavours, but if they’re hot they’ll split the mayonnaise. Chop some spring onions and some fresh dill. Chop the warm potatoes into small pieces. Mix in the spring onions, dill and add enough mayonnaise to coat them thoroughly. You need enough mayonnaise for this to be moist but not so much that they’re swimming in it. Season with salt and pepper and add a squeeze of lemon juice. Leave to stand for at least half an hour for the flavours to develop. Serve at room temperature. This will remind you how good potato salad can be and make you ask yourself why you ever buy it! We have a guest blogger today. Wil Law, who blogs at Ginger Bread Lad, has written us a brilliant and yummy recipe with a great picture. Hello to all blog followers, I’m Wil also known as the ginger bread lad, a friend of Anthea’s who I met on the Arvon food writing course she blogged about, and I’ve been asked to sweeten up this fantastic blog a little with some dessert recipes. I’m not actually a vegetarian but some of my family members are and since I’m more interesting in baking, it seems a lot easier to make veggie-friendly dessert recipes (although meat associated products can be cunningly hidden in things). To kick off I thought I’d do a dessert which could be eaten after Anthea’s recipe for huevos rancheros; churros (try and say that fast). On my own blog I did a toned down, almost English version of this recipe. Here I’m going completely the other way and adding fire in the form of a chilli chocolate sauce (made with the seeds). Anthea often describes my recipes as ‘dangerous’ or most recently ‘evil’ so I thought I’d play up to this. We all know how dangerously evil, yet undeniably exciting a stray chilli seed can be. You could say I’m kicking off with a kick. Begin by making the sauce. Gently heat the cream and scrape in the chilli seeds. I quite like to scrape some of the inside flesh of the chilli as well to add specs of colour to the sauce. Allow to infuse, but not boil, for a couple of minutes before adding the butter and golden syrup. Stir in until the butter has melted then break in the chocolate and allow to melt. The sauce should be thick and glossy. Set to one side. 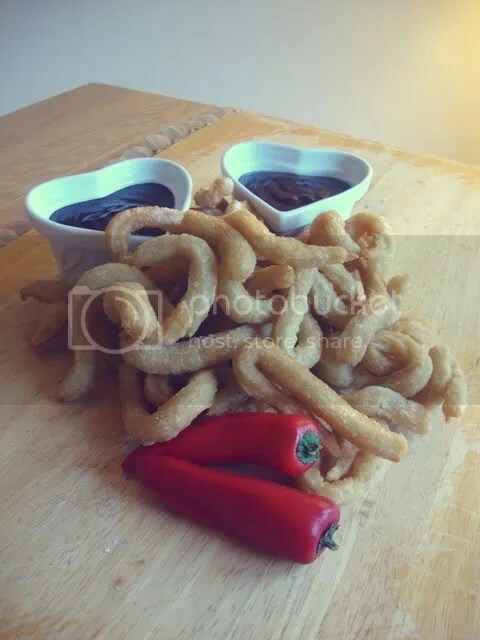 To make the churros mix together the flour and baking powder then stir in the melted butter, make a well in the centre and mix in the boiling water until a thick dough forms. Leave the mixture to one side and either fill a large pan one third of the way up with the oil or preheat a mini deep fat fryer. To test the oil drop in a tiny piece of bread, it should brown within about 20-30 seconds if the oil is at the right temperature. When you reach this stage, transfer the churros mixture into a piping bag fitted with a star-like nozzle. Pipe the mixture straight into the hot oil, pulling the bag upwards to let the mixture fall into the oil. Fry for about 2-3 minutes, or until floating and golden brown. Let the churros rest on a paper towel to remove the excess oil, before rolling in the cinnamon sugar and serving with the fiery chocolate sauce. Although the sauce on a whole has the hum of the chilli, it’s quite fun coming across a seed and truly getting the kick. There’s more to foodie information than books, magazines and cooking shows. There are also foodies on the radio. I have here a selection of BBC Radio programmes. They’re all available on podcasts, with the first three also being available to listen to on the BBC website. The links are there on their programme pages. These are all generalist food shows, I’ll do another post on vegetarian podcasts in the future. Food Programme Radio 4’s serious factual food programme. It can be a bit worthy, it tends to cover one subject for the whole 30 minutes, but it is a ‘must listen’ for keeping up with food news and developments. That said when it covered vegetarian food the ‘carnivore’ presenter expressed surprise at how much taste the vegetarians were putting in their food – *eyeroll*! Kitchen Cafe is Radio Scotland’s food magazine show. Much chattier and livelier in nature than the Food Progamme, they cover two or three subjects per programme with opinions and ideas shared between the presenters. Being based in Scotland, that’s their focus, but don’t let that put you off, most of what they talk about is applicable anywhere. Kitchen Cabinet is a foodie panel show hosted by Jay Rayner. It’s firmly in the tradition of panel shows – a lot of fun based around a subject, in this case, food. I love Jay Rayner’s writing and he’s in his element here being witty (and occasionally silly). These last two are only available on podcast. Cook the Perfect is a ten minute slot in the venerable Woman’s Hour on Radio 4. Celebrity cooks and chefs cook a dish while being interviewed. The quality varies widely with this show and the interviewer never seems to show a huge amount of enthusiasm for food. Most interviewees seem to be there as part of the publicity for their latest book or tv show. Cooking with Paula McIntyre is also a ten minute slot in a larger programme (this time Radio Ulster’s Saturday Magazine) but it is everything Cook the Perfect isn’t. Paula is out to cook good food not sell something. Her enthusiasm and competence shines through, and you can hear the chopping, hissing and bubbling as the food cooks.